Pride Toronto has survived the latest attempt, spearheaded by Councillor John Campbell (Ward 4, Etobicoke Centre), to suspend its City grant of $260,000 until uniformed police officers were allowed to march in the annual parade. After nearly six hours of sometimes heated debate, Council voted 17-27 against suspending the grant. Last year’s Pride parade was interrupted by Black Lives Matter Toronto protesters, who demanded (among other things) that a uniformed police contingent and floats be barred from participating in the parade, as their uniforms symbolized a centuries-long tradition of human rights abuses at the hands of law enforcement locally and worldwide. “You know what city council have never spent all day debating? How to eliminate carding, or strategies to curtailing the deaths of Black Torontonians at the hands of Police, the lack of adequate shelters for homeless peeps during winter storms, the dearth of affordable transit, city policies that literally result in the daily loss of life of Torontonians, and so on,” Black Lives Matter Toronto co-founder Rodney Diverlus wrote on Facebook following the vote. In February, Toronto Police agreed to refrain from marching in uniform in this year’s parade, and have an ongoing dialogue with Pride Toronto. But for Campbell, that wasn’t enough—he sought to withhold the $260,000 grant until Pride changed it’s decision and allowed officers to march in full uniform. Campbell framed his motion as one in support of inclusivity. “This is not about defunding Pride,” he said. “They can do whatever they like.” He argued that barring uniformed officers did not reflect an attitude of inclusivity. And as Campbell has been told repeatedly, gay and lesbian police officers have always been welcome to march as individuals, in street clothes, unarmed. 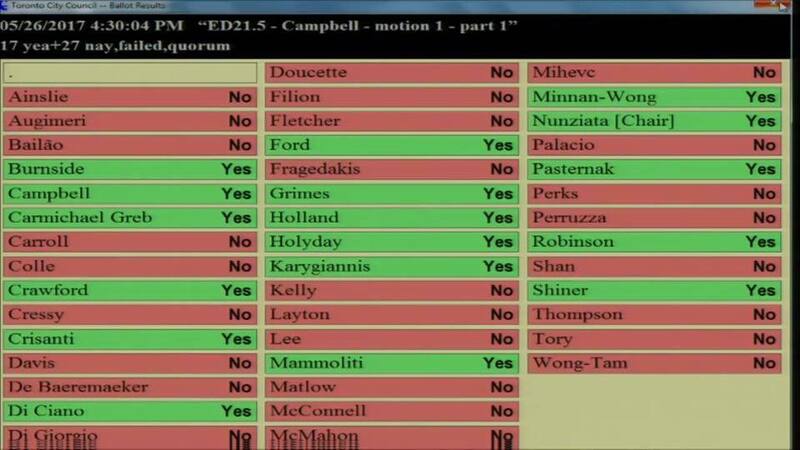 Campbell’s motion found support among a number of councillors. For a time, the vote appeared to hinge on a few key votes. As the day progressed, however, it became clear that although many councillors still had reservations about Pride’s decision to exclude uniformed police from this year’s parade, the majority were unwilling to defund the organization. It’s important to note that City staff told Council repeatedly that Pride was not in violation of any anti-discrimination policies, and recommended awarding the grant. Over the years, Pride Toronto has had its municipal grant threatened many times by groups of conservative councillors offended by various groups or causes included in the parade. From 2010 to 2015, City Hall’s focus was on Queers Against Israeli Apartheid (QuAIA). Before the group finally disbanded in 2015, a group of conservative councillors repeatedly threatened to pull the funding from Pride Toronto if the group marched. Before QuAIA, it was Totally Naked Toronto Men. 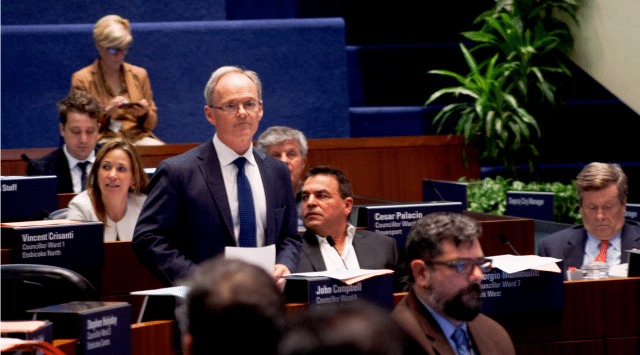 “We should not punish [Pride] because they do not follow our worldview of inclusiveness,” said Councillor Mike Layton (Ward 19, Trinity-Spadina). 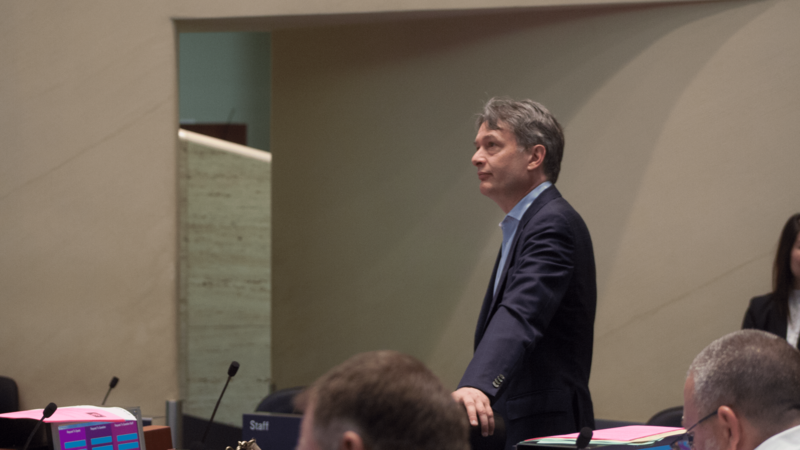 He, like Councillor Joe Cressy (Ward 20, Trinity-Spadina), were quick to acknowledge the privilege inherent in their position as city councillors. In other words, nobody is saying Council has to like Pride’s decision—but it is Pride’s decision, after all. And it’s a decision that Pride members have already made, in a democratic vote, at the annual general meeting in January. Councillor Giorgio Mammoliti (Ward 7, York West) moved a motion to have the grant fund renamed the “Political Correctness Fund,” for which he was later reprimanded by Speaker Frances Nunziata. At one point, he berated members of Pride who had gathered in the gallery, yelling “shame on you!” and pointing his finger at them. He also expressed his desire to jail all of Black Lives Matter Toronto for the group’s action at last year’s parade. At another point, he launched into a tirade about Santa Claus jokes that he felt infringed on his Catholic rights. At another point, he launched into a barely-comprehensible rant so unhinged and vitriolic that it prompted Speaker Nunziata to call an early recess. At yet another, he interrupted to ask why chambers “reeked of smoke,” despite nobody smelling any smoke. At some level, which way the vote went isn’t even the point; the fact that debate got to the level that it did, and has dragged on for as long as it has, is a bit of a stain on the City itself. Let’s make no mistake about what was happening here: the City’s establishment—its police, its politicians, and its privileged—had their position of power challenged, and began circling the wagons in response. For whatever reason, that manifest in John Campbell’s quixotic campaign to defund Pride. Over the years, ‘quixotic’ has come to mean a doomed campaign; futile but motivated by something that, if not noble and pure, has at least some sort of internal logic to it. But Don Quixote wasn’t much more than just a buffoon who decided to take up a sword and call himself a fighter for some cause. So it was Campbell, a man who has never been to Pride—he actually attends a rib festival every year, as he plans to do again this year—who took up the cause. Members of his staff have told me that even they do not understand why he has taken up this crusade. Around City Hall, the sense was that Campbell himself knew this was doomed to fail, but—like Quixote, famously tilting at windmills—he simply needed to make his point. But the point he was trying to make, and the point he made, are two different things. He wanted to make a point about inclusivity, but instead made himself an example of the exclusionary power of privileged positions, and the ability of those with privilege to appropriate the language of anti-oppression and use it for its exact opposite purpose. The irony of it all is that, even if the motion passed, it would not have even impacted the Pride parade. Pride co-chair Alica Hall said after the vote that the money goes toward community programming, such as Family Pride, the Clean and Sober stage, and increased accessibility, making the threat of defunding them largely punitive. For Pride, this was nothing new. “Right-wing city councillors have always tried to find some excuse to go after Pride,” said Rev. Brent Hawkes, speaking to reporters alongside Pride executive director Olivia Nuamah, who reiterated that on their end, discussions with Toronto police were progressing well. That, above all, is the only thing that matters. Pride is not Council’s weekend. It’s not John Campbell’s weekend. It’s Pride’s weekend, and had many in Council taken the time to listen, they would realize that Pride has it completely under control.